Australian toy company, Alimrose makes dolls that young children are immediately going to want to take home with them. Tactile with sweet faces and bendy arms and legs, they’re easy to hold and to tuck under small arms. 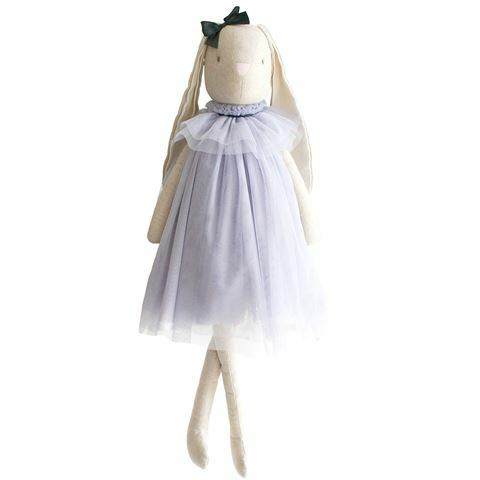 Beth is a beautiful linen bunny dressed in the softest lavender tulle dress with cute floppy ears and a black bow around her head. She would look adorable sitting on a bed or would make a cute companion for all outings. Beth is one of the best dressed bunnies in town. Alimrose has been making beautiful dolls and toys since 1985. With a passion for design and an eye for detail, you’ll want to keep them forever. Linen cotton body with all new poly fibre fill. Suitable from 3 years of age..